Crocodiles, dinosaurs, pterosaurs, and many other beasties! From left, Zuniceratops photo by Geb Bennett; Red-billed Teal © 2003 Don Getty; American Crocodile by Gerald and Buff Corsi, © 2001 California Academy of Sciences; Pteranodon photo by Dave Smith, UCMP. Archosauria (the "ruling reptiles") is a major group of diapsids, differentiated from the other diapsids by the presence of single openings in each side of the skull, in front of the eyes (antorbital fenestrae), among other characteristics. This continues the tetrapod trend of the reduction of skull bones by the fusion of multiple bones and the opening of fenestrae in the skull. This helps to lighten the skull, provides more room for muscles and other tissues, and allows more skull flexibility (kinesis) when eating. Other typical archosaurian characteristics include another opening in the lower jaw (the mandibular fenestra), a high narrow skull with a pointed snout, teeth set in sockets (called thecodont tooth implantation), and a modified ankle joint. Click on the buttons below to learn more about Archosaurs. 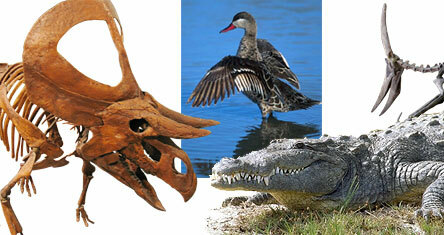 Enjoy this fun page on alligators and crocodiles.